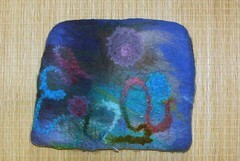 I was extremely fortunate to be able to attend a two day feltmaking course last weekend. On day one, we made a flat panel piece. This is mine, photographed in the orientation that I created it. In the event, I like it best rotated 90 degrees counter clockwise. The colour reproduction is poor and I need to retake all these photos. 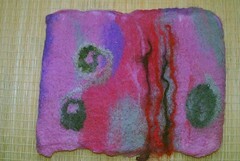 We used Merino wool tops (64s). 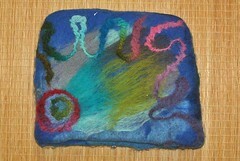 I added design elements with some Colinette yarns that I had kicking around the craft room at home. Thinking about calling this one “Orkney Sunset” – a decision that would make more obvious sense had I correctly captured the colours in my photograph. This piece needs a final steam pressing, as does the second piece – but both are still a little damp at present. I was enormously happy with this as a first piece and quite stunned that I had so much success. I may add some silvery beads to this and then frame it. I was trying for a sub-marine feel on this piece. Again, Colinette yarns were used for the design elements, and I also used some varying shades of the merino tops to introduce some shading. The piece is less brightly coloured than it appears in these shots – and is more comfortably subtle. You will note that neatness and precision don’t enter the frame where I am concerned. I am just grateful that I managed to produce anything that looked even remotely like a bag! The course was arranged by the Sanday Development Trust, held in the Sanday Community School, and led by Carol Dunbar, from the Pier Arts Centre in Kirkwall.